Now, where were we? Ah, yes. The photographs of Sergei Mikhailovich Prokudin-Gorskii (1863-1944) offer a vivid portrait of a lost world: the Russian Empire on the eve of World War I and the coming revolution. Supported by Tsar Nicholas II, Prokudin-Gorskii completed surveys of eleven regions of Russia between 1909 and 1915, traveling in a specially equipped railroad car. His subjects ranged from the medieval churches and monasteries, to the railroads and factories of an emerging industrial power, to the daily life and work of Russia's diverse population. Born in St. Petersburg and educated as a chemist, Prokudin-Gorskii devoted his career to the advancement of photography. 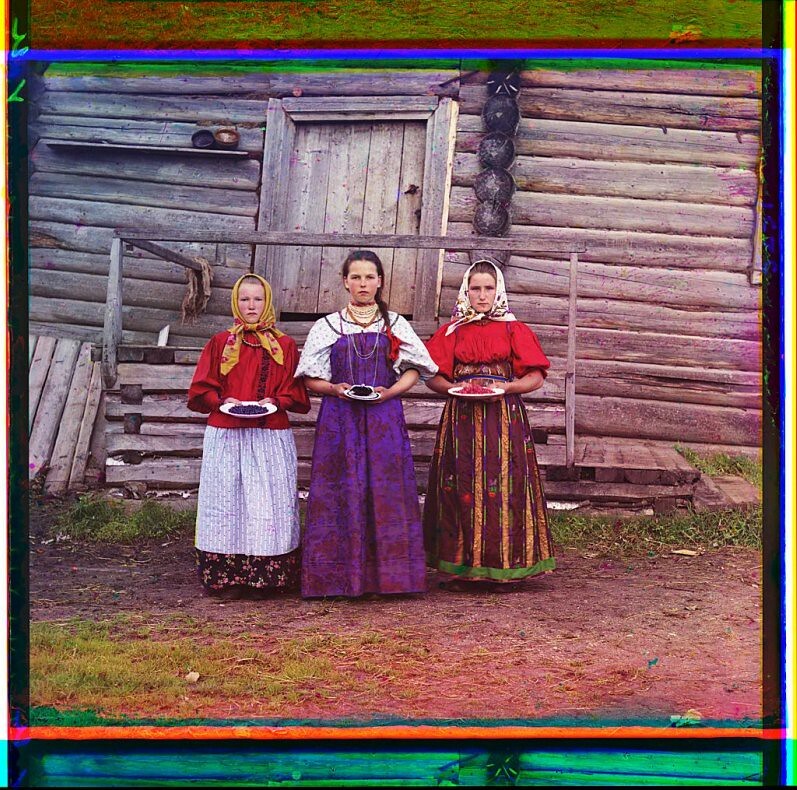 In the early 1900s, while the world was still shooting black and white photographs, Prokudin-Gorskii was busy inventing an ingenious technique for creating color images. Credited with taking the only known color photograph of Leo Tolstoy, Prokudin-Gorskii's technique involved capturing three separate monochrome photographs of the same scene. The same object was captured in black and white on glass plate negatives, using red, green and blue filters. He then presented these images in color in slide lectures using a light-projection system which reconstructed the original color scene. Since the images were captured at different times, any subtle changes or shifts in the scene appear as ghosted images. In 1918, after the revolution, Prokudin-Gorskii went into exile, taking with him only his collection of nearly 2,000 glass-plate negatives and his photograph albums. The collection was purchased by the Library of Congress in 1948 from his heirs. Since 2001, many of Prokudin-Gorskii's plates have been scanned and, through an innovative process known as digichromatography, brilliant color images produced. In 1948, the United States Library of Congress purchased 1,902 of Prokudin-Gorskii's photographs from his family. Prokudin-Gorskii's entire collection of unrestored photographs can be seen on the Library's website. Be prepared for a journey to visual wonderland. :glass-plate negative title: krestʹi︠a︡nskīi︠a︡ di︠e︡vushki. [rossiĭskai︠a︡ imperii︠a︡]. title translation: peasant girls. three young women offer berries to visitors to their izba, a traditional wooden house, in a rural area along the sheksna river, near the town of kirillov.